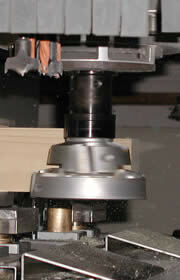 5 axis cnc machines are used for a variety of purposes. Large scale machines can be used to mill automobile sized pieces, including models for wind tunnels or casting. Smaller 5 axis cnc machines are also available, and these can save time by reducing the amount of material repositioning needed for 3D products. In order to understand 5 axis units, it is necessary to take a brief look at 3 axis machining. A standard 3-axis machine operates in 3 linear axes of movement (x, y, z). These axes of movement tell the tool where to begin and stop each procedure, and could produce 3D engraving. But if you wanted to machine the sides of the project you would be forced to reposition the material. In addition, 5 axis cnc adds two more axes of movement (a, b). These two axes allow the cutting tool to tilt so that the sides of the material can be machined. The result is e.g. a woodworking cnc router that can produce highly accurate 3D products quickly and efficiently. CNC routers with five axis are ideal for accurate, high-speed trimming, cutting, and routing of wood, plastic parts, composites, clay, and metals. These routers come in many different sizes, ranging from garage sized machines designed for making aluminum molds to larger models designed for accurate cutting and trimming of large aircraft parts and other components. They are fully automated, and allow the operator to input just a few commands to produce many different pieces. These machines can also help to trim and finish large metal and plastic pieces with just a simple cnc software. Because a 5 axis machines typically takes up a great deal of space, it is highly unusual to see these machines in anything but the largest shops and manufacturing plants. The high cost of a 5 axis machine also makes it prohibitive for users on a smaller scale. The most typical users are companies which need to produce large, one piece products with shaping, carving, or finishing on all sides. Plastics plants, aerospace factories, automakers, and fabricators are just few examples of industries which use 5 axis cnc technology.